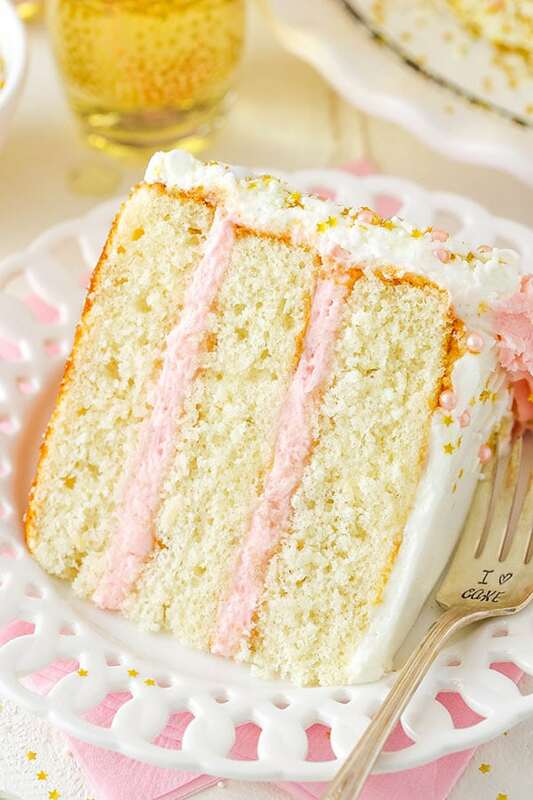 This Strawberry Champagne Layer Cake has layers of moist champagne cake and fresh strawberry frosting! 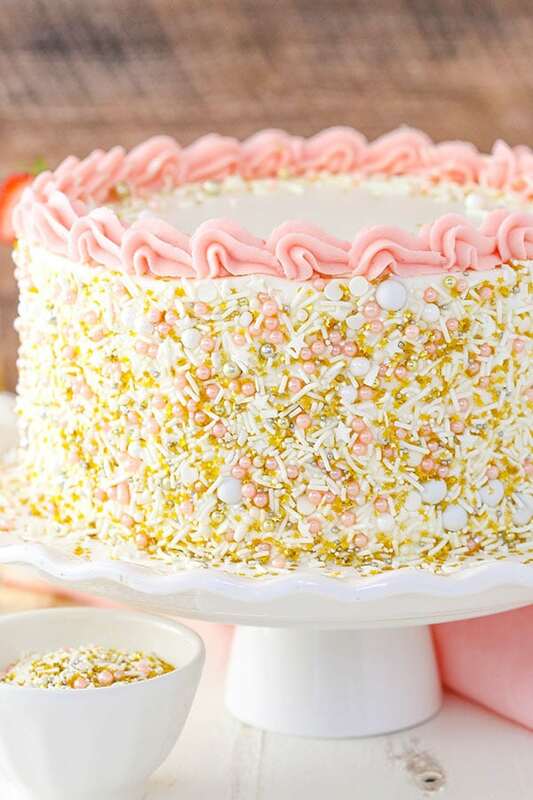 It’s covered in champagne frosting and fun, festive sprinkles for a cake that’s perfect for New Year’s Eve! Is it too soon to talk about New Years when Christmas hasn’t even happened yet? I hope not! I assume by now you’ve Christmas totally taken care of and covered right? 😉 Ha! I know I don’t! If you need a last minute dessert idea, here’s a trifle or two, an easy pie that I LOVE and some no bake cookies to consider. And this cake is totally celebration appropriate. New Years, a birthday, even Valentine’s Day or some day where champagne must be included – this cake is perfect! 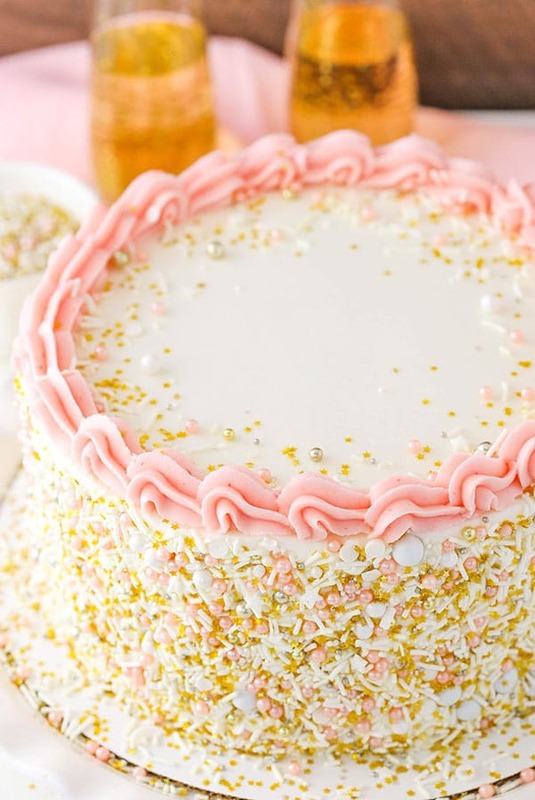 Between the bubbly and the sprinkles, it’s celebration in cake form. So to put the cake together, you start with the champagne. I like to double up on the champagne and then cook it down over the stove to strengthen the flavor. 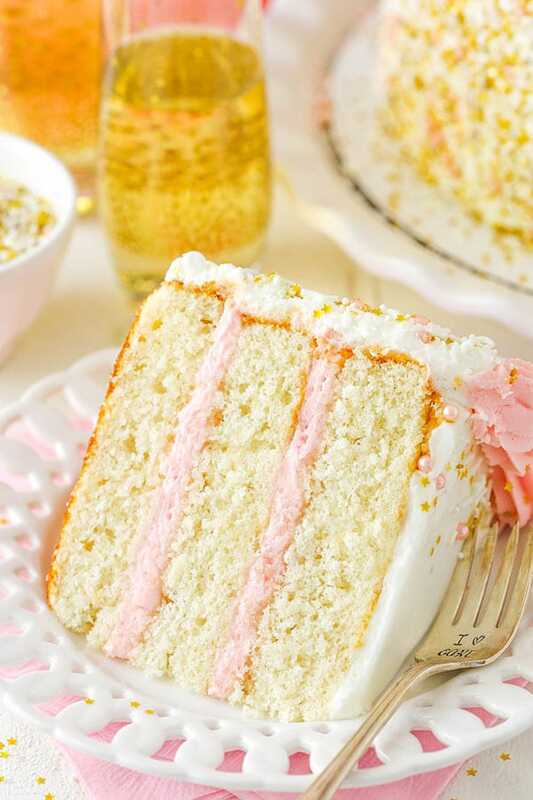 What’s the point of adding champagne to a cake if you can’t taste it? So add the champagne to a saucepan and just cook it over medium heat until goes from 2 1/4 cups to 1 cup. You don’t need to boil it, just heat it and watch the steam rise. Check it occasionally by pouring it back into a measuring cup and seeing where it’s at until you only have 1 cup, then set it aside to cool. Next it’s time to mix the batter. It starts with the creaming of the butter and sugar, which you never want to skimp on as far as time is concerned. You should actually see the texture of the butter/sugar mixture thicken and fluff up and it’ll all lighten in color. It’s important for adding air to the batter so that it has a nice fluffy texture. Then you’ve got some sour cream, which adds nice flavor and moisture, and some vanilla extract. The egg whites add structure to the cake, then there’s the dry ingredients, champagne and milk. Once the cakes are baked and cooled, it’s time for the frosting! I used a mix of strawberry frosting in the layers and champagne frosting on the outside of the cake. The strawberry frosting gets all of it’s pink color from the strawberries themselves. You’ll puree some strawberries in a food processor and strain it to remove the pulp and seeds. Then when it’s added to the frosting, you get a nice smooth pink frosting with the lovely shade of pink. Love it! The champagne frosting uses some of the cooked down champagne that wasn’t added to the cake. 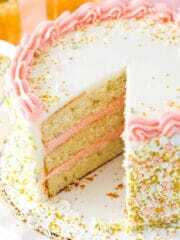 Once the cake is frosted, you want to add the sprinkles right away. It’s a crusting buttercream, so if it sits for even 15 minutes or so, sprinkles will have trouble sticking to the cake. The final cake is not only fun and pretty, it’s delicious! Strawberries and champagne are totally meant for each other! We were big fans of the combination. If you get a chance to try it, I hope you love it! 1. Add all of the champagne to a medium sized saucepan and cook over medium heat until you’ve got 1 cup remaining. Don’t boil. To measure how much champagne remains, pour into a glass measuring cup. Add it back to the pan if it needs longer to cook down. When done, refrigerate until cool. 2. Prepare three 8-inch cake pans with parchment paper circles in the bottom and grease the sides. Preheat oven to 350°F (176°C). 3. In a large mixing bowl, cream the butter and sugar together until light in color and fluffy, about 3-4 minutes. Do not skimp on the creaming time. 5. Add sour cream and vanilla extract and mix until well combined. 6. Add egg whites in two batches, mixing until well combined after each. Scrape down the sides of the bowl as needed to be sure all ingredients are well incorporated. 7. Combine dry ingredients in a separate bowl, then combine the milk and 3/4 cup of the cooked and cooled champagne to a small measuring cup. 8. Add half of the dry ingredients to the batter and mix until well combined. Add the champagne mixture and mix until well combined. Add remaining dry ingredients and mix until well combined. Scrape down the sides of the bowl as needed to be sure all ingredients are well incorporated. 9. Divide the batter evenly between the cakes pans and bake for about 23-27 minutes, or until a toothpick comes out with a few crumbs. 10. Remove the cakes from the oven and allow to cool for about 2-3 minutes, then remove to cooling racks to cool completely. 11. 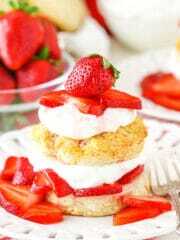 To make the strawberry frosting, puree the strawberries in a food processor. Strain the puree through a fine mesh sieve to remove the seeds. 12. In a large mixer bowl, beat the butter and shortening together until smooth. 13. Slowly add half of the powdered sugar and mix until smooth. 14. Add 3-4 tablespoons of strawberry puree and mix until smooth. 15. Slowly add remaining powdered sugar and mix until smooth. Add additional strawberry puree, as needed to get the right consistency. Set aside. 16. To make the champagne frosting, beat the butter and shortening together until smooth. 17. Slowly add half of the powdered sugar and mix until smooth. 18. Add 3 tablespoons of champagne and mix until smooth. 19. Slowly add remaining powdered sugar and mix until smooth. 20. Add remaining cooked down champagne (from the cake), as needed. 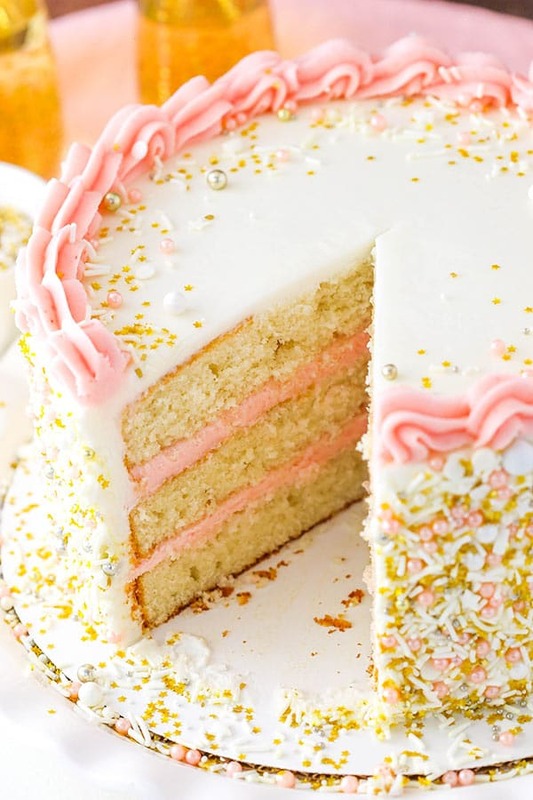 If you run out of champagne and the frosting is still too thick, add a touch of water or milk. You want the frosting to be a little bit sticky, so that the sprinkles stick easily later. 22. 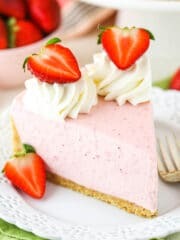 Set aside about 1/2 cup of strawberry frosting, then spread about half of the remaining strawberry frosting evenly on top of the cake layer. 23. Add the second layer of cake and another cup of strawberry frosting. 24. Top the cake with the remaining layer and frost the cake with the champagne frosting. Refer to my tutorial for frosting a smooth cake, if needed. 25. Press the sprinkles into the sides of the cake. Do this immediately, before the frosting crusts and the sprinkles will no longer stick. 26. Use the strawberry frosting that was set aside before to pipe shells around the edge of the cake. I used Ateco tip 844, but Wilton 1M or 2D would work as well. 27. Sprinkle the top of the cake with some additional sprinkles, if desired. Looks delish! When preparing the pans for baking, do you grease the parchment or just the sides of the pans? Thanks! 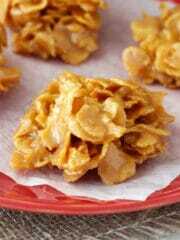 I usually grease just the sides and then add the parchment paper. What kind of champagne? Is there a specific one too use? I wouldn’t say there’s a specific one to use. I believe I used either Korbel or Barefoot. Wow! This looks wonderful. So festive for the New Year. The cake is fluffy and moist, just the way I like it. I will definitely give this one a try. Thanks for sharing. A blessed holiday to all! OMG, this cake is way to beautiful to cut or eat. Stunning! If you don’t want to use shortening in the frosting, can you just use all butter instead? Lindsay, if you substitute butter for shortening, is it equal amounts? 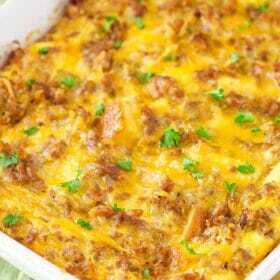 Can not wait to make this for New Years Eve. I have used freeze dried strawberries in the past to make strawberry frosting and ice cream. Do you suggest purée strawberries for the frosting to give it more wetness?? Just curious. Are you looking for just the juice of the strawberries or the mush( if that makes since). Thank you again for another beautiful creation and sharing the scripture. Have a blessed Christmas. Either would be fine. 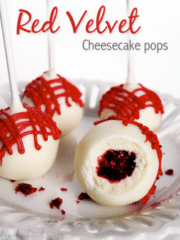 I have used freeze dried strawberries as well and it also makes a great frosting. If you do that though, you will want to replace the puree with some water or milk or something for moisture. I hope you enjoy it! Merry Christmas! I’ll definitely be making this one! You mentioned that this was a “crusting” buttercream frosting–is it different from your other buttercream frosting recipes? 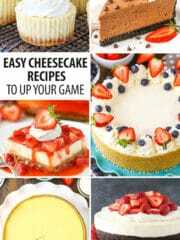 I have made several of your cakes that had buttercream frosting which always turned out great. I haven’t tried this in a bundt pan to know for sure how it’d turn out. So glad to hear you enjoyed it! You should be able to replace the champagne with milk and it turn out fine. It’s possible you might want to reduce it just a bit, but I’m not sure without trying it. Can I use strawberry soda instead of champagne? Hmm, not sure. You could try it. Might be ok.
Made this just as listed and it was DELICIOUS! I’m a new-ish baker, and this brought fun, new techniques for me to try – and even better, LOTS of great comments from those who had it at my mother-in-law’s birthday party (yes, high pressure!) Thanks, Lindsay!! Made this for new years potluck. Frostings came out delish! But my cake was way dense 🙁 Any ideas where I went wrong? Looks amazing!!! Can this cake be frozen, cream and all, and then defrosted when I want to serve it? And would it be ok if I substitute the sour cream for a non-dairy s our cream, and milk with almond milk? Thanks! The condensation from defrosting could mess with the colors and sprinkles, but otherwise I think it’d be ok. As for the substitutions, they’ll likely work, but because of the lower amount of fat will affect the moisture and texture of the cake. 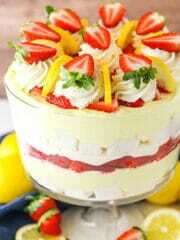 This cake looks amazing!!! What could I replace the champagne with since I don’t like to use alcohol? Are you still trying to maintain the champagne flavor? Or make a vanilla cake? I believe Wilton has champagne flavoring you could use as an extract and replace the champagne with water or milk. Thank you for responding. 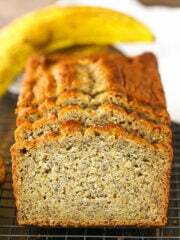 I’ve tried several of your recipes before and they always turn out great. 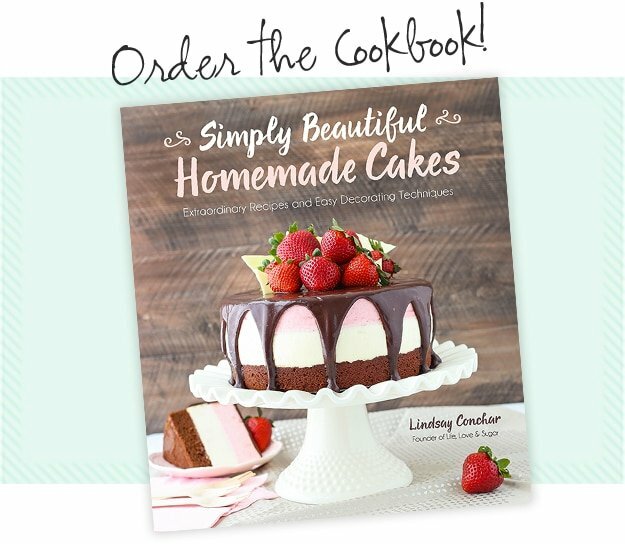 I also have your book and it is my go to book for cupcakes and cakes. I made this and it was absolutely amazing! The strawberry buttercream frosting was THE best frosting I’ve ever had! Everyone loved it. The only thing I changed was that I frosted the outside of the cake with Swiss Meringue Buttercream (adding in the champagne). Hiya, making this as a birthday cake for my bestie. One concern you say 3/4 cup of milk but in brackets it says 60mls. I’m going with 3/4 cup milk. In NZ 3/4 cup of milk is 177mls? Which measurement is correct? Thanks for pointing that out – I’ve update the mls to read 180ml. The 3/4 cup is correct. Hi Lindsay! I’m planning to make this cake for my husband’s birthday! 🙂 Would I have to make any changes to the recipe if I were to make it using 9 inch round cake pans rather than 8 inch round cake pans? Thanks! You’d probably want to adjust baking time a bit. If you’re using three pans, you’d want to reduce it a bit. If using two pans, it might be a similar time, just a few minutes more or less. I made this cake when my husband and I renewed our wedding vows. Thank goodness we only invited a few friends and family to celebrate, because there wasn’t a crumb left!!! 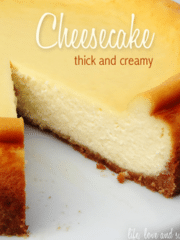 It was beautiful and your directions are written so that the recipe is super easy to follow. Thanks Lindsay for making my day extra special with your Strawberry Champagne Layer Cake!!! Aww, wonderful! Congratulations on your vow renewal! I’m so glad the cake was a great addition to the celebration! You could make it and freeze it for up to a month in a well sealed container. Amazing!! 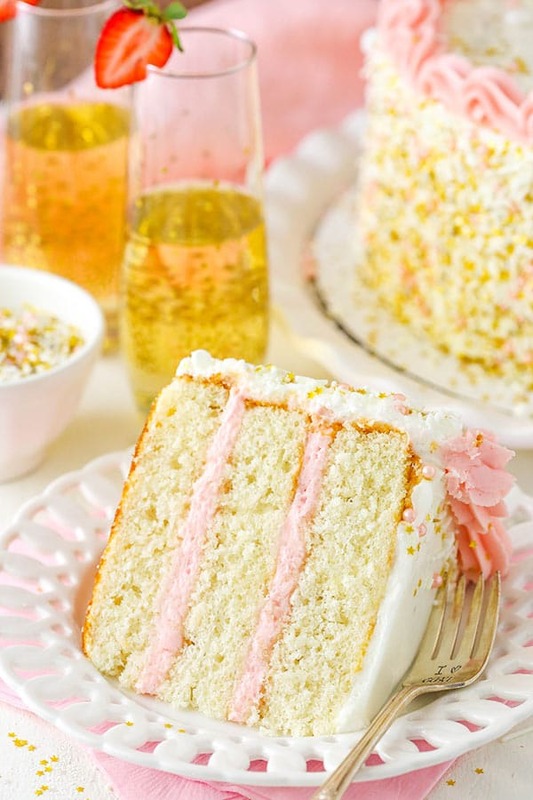 Do you think I could use Pink Champagne for this recipe?! I made this for New Years Eve, which is tomorrow, and the recipe and directions could NOT have been more clear and easy to follow. Great job. I followed the recipe and instructions to the letter and it all worked out tremendously well. My only question, and maybe I am just messy, but applying the sprinkle mixture to the outside of the cake was a mess. As in, they seemed to go everywhere. I mixed them together in a bowl and them placed them in the palm of my hand and moved to press them into the buttercream before it crusted. It was tough to do this without pressing too hard on the cake and maybe 50% of each palm full was attaching to the cake and the rest were falling down around the base of the cake and the counter. I’m super excited to try this! A tip for strawberry ( or any fruit icing/frosting/buttercream) is to find the freeze-dried version of the fruit. If you can find freeze dried strawberries at the store, grab a bag and put them in a food processor until its a powder. Add to room temp butter, vanilla, powdered sugared, and voila! Super delicious buttercream, it won’t get watered down, it won’t spoil as fast, the consistency will hold, it’s less mess, less work, and tons more flavor! My first time trying any of your recipes. New-ish Baker. It turned out great! 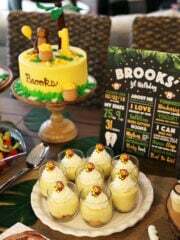 The cake was so moist and the strawberry icing was my favorite! I can’t wait to try your other recipes. I made the recipe twice. Both times were fantastic! Also, I dusted on some gold lustre dust on top which really finished it off well. I was wondering what the advantage is to adding shortening to the frosting? Is to give it more shine? Thanks so much! I knew there was a good reason.